The morning after I got back from Yosemite an email message from a place I used to visit regularly was waiting. They didn't actually say "would you please just go away" but it felt like that. After every trip this year there has been a similar message. Route 66, SuperTour, now Yosemite. Different sources, unrelated to the trip, same idea. Can't escape what's going on at home. In the message content it is difficult to locate compassion or understanding. I'm not saying it's not there but it's not jumping out at me either. There isn't really a 'we're in this together' kind of vibe. It's more like "when things don't work out it's your problem not ours". Sure I might be misreading the vibe. For the sake of this post suppose I'm not. When bad things happen, especially when the badness is hard to quantify or prove, people stop showing up. Institutional mechanisms, like private disability insurance, fail. Doctors jump ship. Employers can't fulfill their legal obligations. They can choose whether to be involved. Good to be them. Warning—/this is not a trail/travel beyond this point is dangerous/ without climbing equipment./ Return to Tioga Road. Hiking in Tenaya Canyon is dangerous and strongly discouraged. This language attracts some daredevils, looking for the forbidden. Lots of people have been rescued, some killed. The National Park Service responds by disclaiming any liability from what hikers do in Tenaya Canyon. If you get into trouble there, it's your fault. The difference being, those who enter Tenaya Canyon do so by choice. 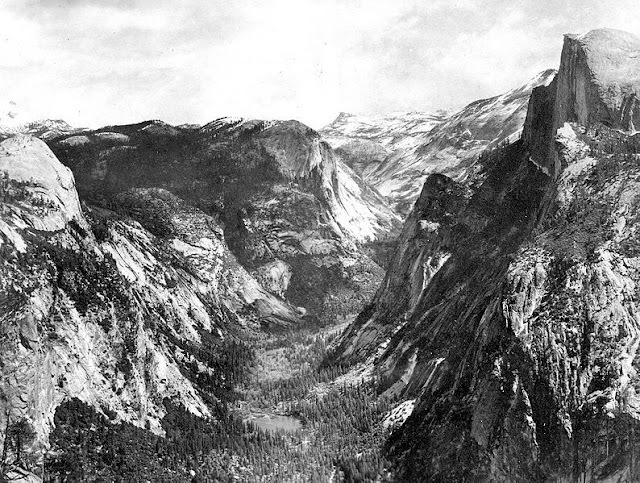 John Muir actually sustained a head injury in a fall here, and was saved by some bushes. He climbed out the next day with a concussion, and some difficulty. Here is an account of what it takes to get out intact. Navigating brain injury is a lot harder than it looks. No trail. Mandatory rapelling. Navigation issues. Immersion in water. Black flies and rampant poison oak. Welcome to my world. Brain injury survivors don't choose Tenaya Canyon. It chooses us.